Out of the Darkroom, Into the Light | Bloom In the Dark, Inc.
I’m so excited to introduce to you another Ex-Victim who has shared her testimony of brokenness and abuse to give hope. Tracey Casciano is an inspiration. I’m thrilled to be sharing this book that showed me how God is always faithful to meet and heal us. I cried through parts of it, but finished it with great hope. I’m blessed to be friends with someone else who refuses to stay silent. Thank you Tracey!! Q: Did you always want to write a book? A: Not this book! I am a mother to four wonderful sons and thought that it would be fun to write about all the experiences (good and not so good) that I’ve had. When God told me to write this book, I was very scared. Q: Which has been tougher – forgiving your parents or believing in yourself? A: I have an amazing husband and incredible friends who have helped me believe in myself. Forgiving my parents was tougher because I thought it meant that they would be “off the hook” for what they had done. Once I learned that forgiveness would allow me to move on, it allowed me to be free. Q: What are some of the most dramatic early responses from your readers? A: My closest friends from my childhood and my in-laws were shocked by what I had endured and were very supportive. Others who read my book started sharing that they too had a similar past, which confirmed the need for this book. Q: What was the hardest part about writing this book? A: I struggled with the memories and emotions as I wrote the book, but as I realized that I was writing to help other people, it became easier. My story is just one of many out there and I feel strongly that these stories need to be heard in order for victims to heal. Q: What is your message to readers who are struggling as a result of childhood abuse? A: You aren’t alone! I didn’t tell anyone about my past until I was 41 years old. I was full of shame and guilt and was afraid of being judged. Get help, trust God, and remember that forgiveness will ultimately bring you peace. Q: What are your goals for “Out of the Darkroom”? A: My goal is to have my book get in the hands of those who need help with healing and forgiveness. I hope that by sharing my story other victims will feel more free to talk about their past and the stigma of abuse will go away. 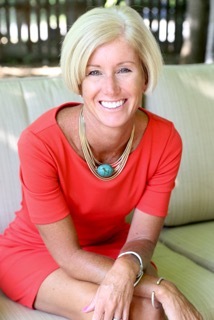 Tracey is a passionate speaker and writer ready to shine a light for Jesus. She shines that light through encouraging words as a blogger, speaker, and writer to help others who may be suffering or doubting themselves on their current path in life. After a childhood with an alcoholic mother and abusive father, her love for the Lord helped her rise above her past. 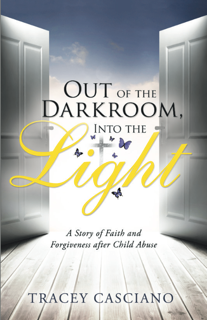 She describes this in her book, “Out of the Darkroom, Into the Light: A Story of Faith and Forgiveness After Child Abuse.” She is happily married and in the midst of raising four wonderful sons. Tracey has a background in Special Education, has taught History in public high school for eight years, and has been a missionary in Guatemala and the Dominican Republic. Learn more about Tracey and her book at her website www.traceycasciano.com, on her blog https://Ephesians2v8.wordpress.com, twitter @TraceyCasciano, and Facebook page (https://www.facebook.com/TMCasciano/).